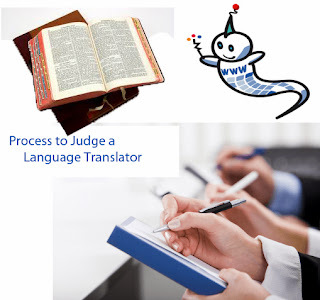 Somya Life Science Translation Agency: HOW TO JUDGE ANY LANGUAGE TRANSLATOR? I hope that you all agree with this point that the feedback which we normally received from the end users about any product or services will ensure us to judge the quality of any product or services. In translation industry also we judge the quality of the finished product based on the translation quality of any linguist. But the question is how a company obtains an effective and quality based translation from their translators or linguists. First of all, selection of any translators, editors, proof readers and reviewers are done based on several criteria, also they required to know what the priorities, exact project was and who will be the end user. All are depend on selection of best linguists to accomplish the task. Diversity of domain, context area, content, project importance and its various paradigms will consider and forced us to select on that basis only. Sometimes companies will ask "native speakers" to read the translation and tell them if it's any good or bad, and then have to compare with conflicting evaluations. The problem usually is related with that the evaluators are either not very mush qualified to judge, or afraid to offend. It may also happen some times, that although native speakers, there are some peoples who have lived in the other foreign countries for years and have lost touch with their native language, or never knew it very well, particularly if they were educated in other places. It may also happen that the translator which you had chosen to complete your tasks is of well known, domain specialist native linguists. But it is not necessary that you will get the same for review and proof reading. So, it very much required to fill the feedback forms before handed out to the desired candidate. We can also mark or categories to rank it as excellent, good, fair, or poor. With the help and support of some QA tool you can also judge and ensure about the translation quality from technical perspectives. For assurance about linguistic quality, it is must require to inspect and get the feedback from third party reviewer who will review it and follow all the client instructions, norms and standard. In standardization of any rules and regulation is always includes the concept of glossary, style guides and special instruction which you neither violates nor ignore. The deviation and inflection of glossary might be happened but only when they have the specific and sufficient reasons or explanation behind it so that each and every linguist will able to prove their translation as quality translation and maintain the dignity and standard of the complete assignment. You always require remembering that your end user is not a qualified translator and is not judging the translation, but they can assure you about the quality of the finished product. The fact is that the average user of a translation has no idea how to judge them, and usually gives an opinion based on civility, orneriness, desire to please, or any number of other factors. So, the selection of every process should be very identical and clear so that from very first to last everyone should understand it and follow it.